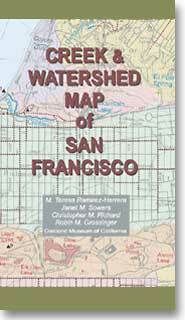 Creek & Watershed Map of San Francisco. The printed version of this map presents both the historical and modern hydroscapes of the creeks of San Francisco and the dune field that dominated much of the city. Today the waterscapes is totally modified by the collection of runoff into the combined storm water / sanitary waste sewers.